Upon learning of the McLaren Speedtail’s flexible carbon fiber rear ailerons, I shot off a couple of emails to McLaren to learn more about how and why its engineers pulled this off. Here’s what I learned. The first question I asked in the brief email interview is how McLaren was able to get the carbon fiber so flexible, whether the “unique carbon fibre and titanium weave” used in the car helped in any way, and if the setup required any special resin. Director of Engineering Design Dan Parry-Williams told me that, really, the pliability just came down to geometry. “We developed the shape, thickness and carbon ply orientation to provide the right stiffness/flexibility,” he told me. “The titanium is not required for that,” he continued, going on to say that the resin that the team used in the rest of the car was “suitable” for the job. My next question was about fatigue failure, and how McLaren made sure that this aileron design could be actuated cycle after cycle without issue. “Carbon fibre has excellent fatigue properties,” Pary-Williams said, going on to remind me that the material is often used for springs, and even in Formula One “flexures”—joints that connect the race cars’ suspension arms to their chassis and allow for suspension articulation. Carbon fiber springs are nothing new, and they’ve proven themselves on the racing circuit, which is why they should work well in this application—an application that which Carfection shows up close in the video below. Staying on the topic of fatigue strength, Parry-Williams told me: “We have already rig tested the system to the number of cycles consistent with the target lifetime mileage with no failure.” Speaking of how the paint at that joint holds up, he said it’s designed to be “flexible enough to stay bonded without cracking,” and that his team tested it to make sure it holds up over the life of the car. Referencing the aesthetics at that joint, he told me that keeping the setup looking pretty while deployed took some work. “The appearance of the moulded edges, gap conditions and mechanism is also important when the aileron is deployed and presented an additional challenge,” he said. That mechanism is a “machined aluminium lever,” which is found under the flaps, and controls the ailerons’ positions. “Also, the exterior surface in the flexible region has to be exactly correct to avoid distortion, twisting or buckling,” he mentioned as another challenge to his engineering team. 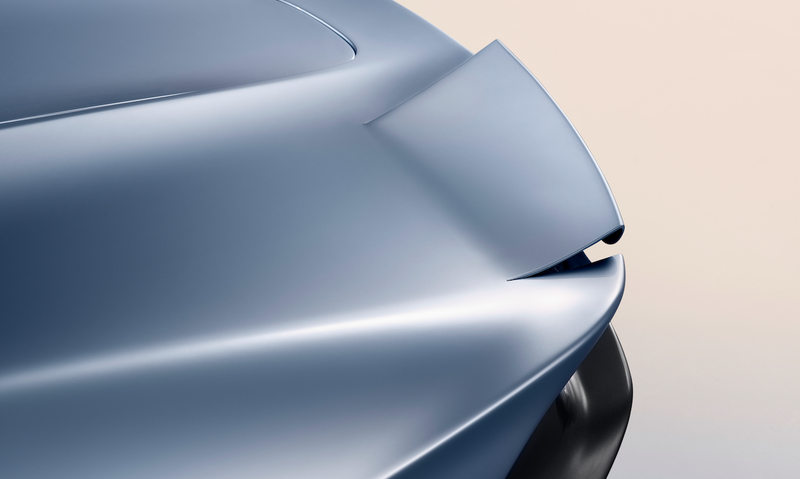 These dynamic elements are hydraulically actuated and an integral part of the rear clamshell, formed in flexible carbon fibre; the body of the Speedtail can quite literally bend. With a tolerance of only 1mm between the surfaces, this dramatic new technology all but removes any gaps or shutlines between the vehicle and the leading edge of the spoilers, meaning there is no turbulent air, no drag and no loss of speed. McLaren has patented the flexible aileron design, which I must say, has a definite cool-factor to it, hence why we mentioned it in our Speedtail intro headline. It makes good sense, given the properties of carbon fiber, and with McLaren saying the aesthetics and fatigue challenges have all been thoroughly tested, I’ll admit that I’m a fan.